Last week, I made the Raspberry Pi blink an LED a few times. As thrilling as that was ;) I almost immediately wanted something more. Note: Source code for this project is available on GitHub. The first thing I did was head over to wikipedia to read all about morse code, and to decide how much I wanted to implement for this project. 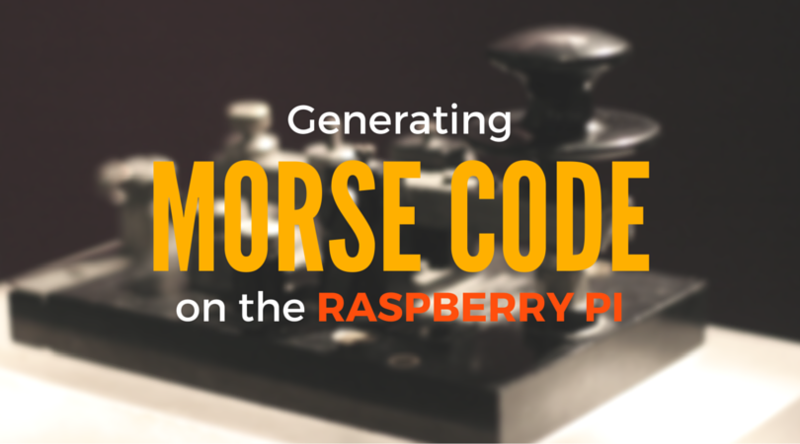 Morse code is a method of transmitting text as a series of on-off tones, lights, or clicks. One variant is called International Morse Code (IMC). IMC consists of the Latin alphabet (A-Z), Arabic numerals (0-9), some punctuation, and procedural signals (prosigns). Each IMC symbol is represented by a unique sequence of short and long signals called “dots” and “dashes”. Prosigns are sequences of letters which have special meaning, such as AS for “Wait”, SN for “Understood” or SOS for “Distress”. Here are the rules regarding timing, for relaying a message in morse code. The wikipedia page also includes a morse code reference chart we can use for translating. That should be enough information to get started. Here are a few notable notes about the approach I took. The first thing I decided to do was get the above chart into a dictionary. Now I can look up any character and get its morse code equivalent. 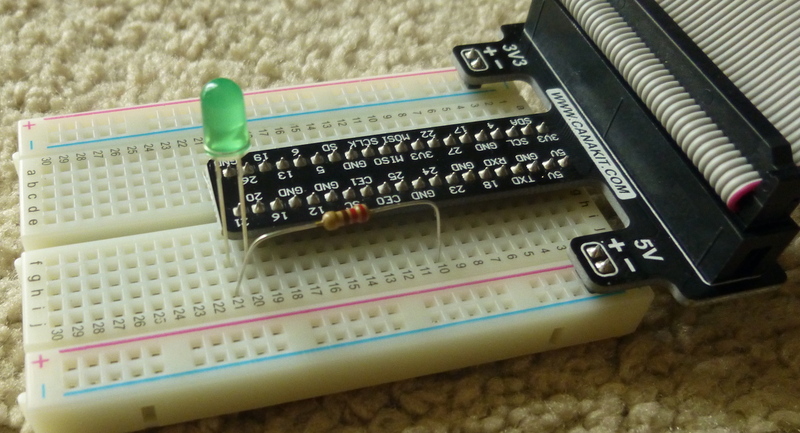 The GPIO module is a library of methods that make manipulating the GPIO pins easy. As easy as specifying which pin to use, if it’ll receive a signal (in) or send one (out), and whether it’s on (high) or off (low). I found it easier to develop on a laptop with PyCharm installed, instead of on the Pi itself, so I didn’t have access to the RPi.GPIO module. As a workaround, I created a mock file with the same functions I’d be accessing from the RPi.GPIO library, each of which just printed a message to the screen. It prints “Sending High signal” when it should’ve turned the LED on, “Sending Low signal” when it should’ve turned the LED off, and so on. Whether importing the real library or my mock, I made sure to give them an alias of “GPIO”. Running the program on the Pi was then as simple as replacing import GPIOmock as GPIO with import RPi.GPIO as GPIO, and all other lines of code referencing GPIO.whatever() could be left as-is. The user can input a full sentence, but that has to be broken down into smaller components for transmission. Python’s split() command breaks up the initial sentence into words nicely, and from there it’s loops all the way down. Do something for each symbol, in each letter, in each word. And since all intervals between the dots and dashes are simply a multiple of the base unit time, defined as the time for a single “dot”, I created a variable called UNIT_TIME that represents seconds. Everything else – dots, dashes, space between letters and words, is based off of that, per the rules above. We can change the value in UNIT_TIME to transmit messages more quickly or more slowly. If you try this out yourself, let me know how it goes! Here’s the source code again, if you want to see how I did it. If you improve on it, or find a flaw in my approach, I’d like to hear about that too! Share in the comments below, or hit me up on Twitter. What else did I learn this week? The circuit I created for this was as simple as it gets. But I’ve seen some that use most of the breadboard and have wires crossing everywhere, and in those cases a tool that helps map out the design of the circuit may be useful. I haven’t tried these yet, so I can’t say much else. I mocked a few functions for this short program, but when I find myself doing something more complicated that uses more of the GPIO library, I’ll check into gpiocrust. A concise, pythonic wrapper around the Raspberry Pi’s RPi.GPIO library. An encrusting, if you will. With (almost silent) fallback to mock objects, you can prototype pin I/O locally on your favorite computer, even when your Pi is on the other side of town (see Mock API for more details). gpiocrust is fully compatible with Python 2 and Python 3. The RPi.GPIO module makes it easier to access the GPIO pins. I used it a little bit here. If you’re interested, here’s some documentation.